¡Hola! Buenos días, amigos. Returning refreshed from a quick trip to Mexico I thought I’d write a couple of lines about my brief experience in Puerto Vallarta. We stayed at an all-inclusive 4½-star resort, which is probably the best way to stay in a Mexican resort town. The food was great and plentiful, the drink even more plentiful and included. The hotel had its own beach, which was great – fine sand and mild waves. Getting out of the hotel and even back in was like crossing through Checkpoint Charlie in the ’70s. I guess they have had some issues with bandits robbing busloads of tourists and they try to keep the vendors away from the hotel where they can bother the visitors. My hotel (Dreams Puerto Vallarta) with its secluded beach and strong security meant that we were only bugged by the hotel-approved vendors, but there were more than enough of them selling everything from blankets to silver, carved animals to para-sailing rides (I have to admit to trying the para-sailing). We did take a trip into downtown “old town” Puerto Vallarta where every step is echoed with calls for “Buy this”, “Buy that”, ”Try my tequila” and “Eat here”. This cajoling soon becomes a background murmur and it ceases to be an irritant. Harder to take is the look of abject disappointment if you stop to look and don’t buy, followed by “Why you no buy?” ”Please, señor, I have babies to buy food for,” etc. There are a few beggars about but at least they have their hands out and you have no doubt about their mission. It looks to be a rough place and I don’t think I’d be venturing out at night into the downtown core unless I had a couple of tough friends with me. The best bet is to stay on the resort hotels (and there are an awful lot of them) and maybe trip from one resort to another via sanctioned travel if you need to. It can be a relaxing holiday if you want it to be but there seem to be many areas where you could come a cropper if you don’t have your wits about you. Security has to be a major consideration when planning a trip to Mexico. The people are poorly paid and only a few are educated to beyond a high-school diploma, it seems. The average wage for areas like Puerto Vallarta and indeed most resort towns is a paltry $5.00 a day (yes, a day) while most people in the USA and Canada are on a minimum wage of close to $10.00 an hour. That huge disparity makes for a large wage gap and a resulting “us and them” scenario. It doesn’t help matters that the value-for-money expectations of some of the guests were ridiculous (the majority were Americans) and they didn’t seem to mitigate with time. The Mexicans live in poverty for the most part and seeing all that wealth on display in the resorts must be difficult for them. I can understand the drive to get some of that money by hook or by crook and maybe that explains all the scams, banditry and plain robbery that goes on in Mexico. The drug trade is huge as it offers some people a good living, they regard other people as worthless pawns to move or dispose of as they see fit and so you have to be very careful to stay well away from areas known as drug areas. The police are paid as badly as the rest of the populace and apparently corruption is rife, they may be no help when it comes to the crunch. Would I go back? Yes, no doubt – I’d even stay at Dreams again – but I would stick to the all-inclusive resorts and just lie back and enjoy the sun, food and drink but not necessarily in that order. I’d just encourage visitors to keep their eyes open and their wits about them. Maybe even tip a bunch more and share some wealth. Of course this was my impression of what I saw and experienced, others’ experiences and impressions may be different. Book Puerto Vallarta hotels NOW with Agoda! This entry was posted	on Thursday 31 October 2013 at 10:22	and is filed under Mexico. You can follow any responses to this entry through the RSS 2.0 feed. You can leave a response, or trackback from your own site. Wow ! 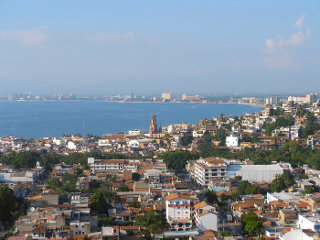 There must be another Puerto Vallarta, a different one to the town I’ve lived in for the past 8 years or so !? Ex-pat Yorkshireman here, living literally 5 minutes drive from Dreams, the all-inclusive hotel Graeme stayed in. Yes, Dreams has a high level of security, but so do all/any of the better hotels, especially when located outside the town boundary on an un-lit section of the coastal highway. That security also ensures that itinerant holidaymakers simply do not wander into what is after all a very upmarket resort hotel, trying to use its facilities. “It (the downtown) looks to be a rough place….” The Zona Romantica abounds with international quality restaurants and bars, many of which would do credit to places back home, but at a fraction of the cost. On the 15th May we will be celebrating the start of the 10th annual Restaurant Week (it’s actually a fortnight!) when businesses throughout PV stage special menus at fractions of the usual cost, attracting many visitors from afar. In November we will see the 20th annual International Gourmet Festival, when over 30 guest master chefs from around the world take over the kitchens in various established restaurants sharing their talents, secrets and techniques for the benefit of returning diners year after year. The number of art galleries in PV is legion, and the South Side Shuffle, where the downtown área in the evenings becomes a mecca for visitors mingling with wandering musicians, thronging into the many galleries, many of them offering wine and canapes, and has become an institution in this multi-cultural city.The city opened a new 1,000 seater theatre a couple o fyears ago, wjich has seen performances by touring European opera and ballet companies amongst others, while there are several other stage venues now offering a plethora of live performing arts. Oh, I should also mention there was almost a riot here when Enrique Iglesias (THE Enrique) performed a.live FREE concert here on the Malecón to accompany his friend Alejandro Fernández, another internationally acclaimed artist. (this pair of old fogies got within half a mile of the venue, saw the crowds, and went home for another G & T on the balcony!). “The Mexicans live in poverty for the most part……” Yes there is poverty here as in many many countries, but the reference to an average wage here in PV of $5USD per day is highly erroneous. In one of Mexico’s main coastal tourist towns (such as PV), one of the most common forms of work for women is to be a maid, either in hotels or working for property management companies who look after the homes here of ex-pat gringos. The wage per sessión is around $200 pesos ($16usd), and a decent maid can clean 2 or 3 condos in a day – we know of maids who are taking home $2,000 pesos per week ($160 usd) and are VERY happy with that, especially if their kids are also bringing in that level of income. In addition their employers also pay social security for them, ensuring they have access to health care and medication when required. “The drug trade is huge…..” – yes ilegal drugs are on sale here, but it is no more overt than in any major town or city in the UK from what I read in the “home” press…..and “yes” there HAVE been killings, notably of North Americans, but in each case it was later disclosed that these folk had been attempting to muscle in on the dealing scene here (and for “here” I mean Mexico at large, as at least 2 of the reported killings a couple of years ago were of Canadians in the Yucatán on the east coast,). My drug of choice is a G & T (which may be my demise ahead of what other folk prefer to ingest), but quaffing a Tanqueray and tonic on the balcony as the sun goes down is what retirement is surely about (?!). I do however watch closely what goes on around me, and the cartel problems one reads of in relation to Mexico are to be found well away from Puerto Vallarta. In conclusión, if you DO indeed pay a return visit Graeme – look me up mate, and I’d be pleased to show you the REAL Puerto Vallarta ! !